“THE greatest hazard of all, losing one’s self, can occur very quickly in the world. 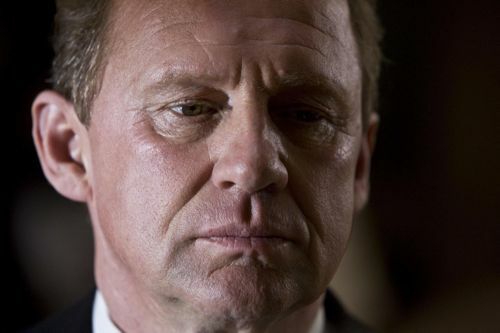 Sir Harry quotes Kierkegaard in Spooks series nine, episode five. Which means the President of the USA – codename Lighthouse – is London-bound to chair a top secret meeting at the Prince Edward Hotel. Seizing a historic opportunity to bring about peace in the Middle East. While the rest of the world think he’s having tea with Her Maj at Buckingham Palace. “The Queen is in on it,” Ruth reassures The Grid. I wouldn’t be surprised if Ms Evershed has excellent royal connections. Having been a lady in waiting, of sorts, for so long herself. Harry also has friends in high places. 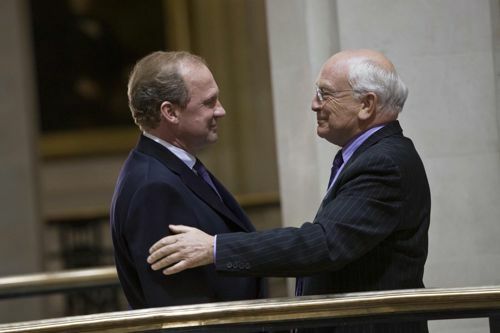 He’s an old pal of Levi Cohen, one of the leaders of the Israeli delegation, played by Paul Freeman. Levi asks Harry if becoming “a duke” has gone to his head. “I’m a knight, Levi,” replies Harry. “And on the day I became one, so did a 80-year-old disc jockey and a champion shot putter. Ashes To Ashes fans will recognise actor Joseph Long (Luigi) as Raed Elwan, deputy leader of the Palestinian side. While the MI5 team race to intercept a terrorist threat. Cue yet more “facial recog”. Lucas / John betrays a possible past in furniture removal. Ahead of another twist in the tale in the closing moments which I didn’t see coming. Fans of all things Harry and Ruth may also care to watch out for the “Next Week” teaser trail. But I’ll leave you with this photo of William Towers and his backing band, which surely begs a caption competition. Posted in Spooks and tagged Joseph Long, Nicola Walker, Paul Freeman, Peter Firth, Richard Armitage. 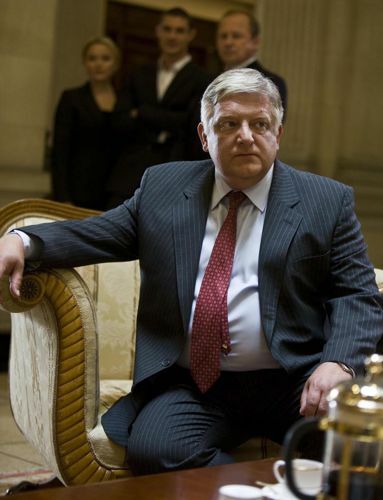 Simon Russell Beale, Spooks. Bookmark the permalink. Looking forward to seeing how the team deal with the latest and greatest threat of the week! Another excellent preview, Ian. Thank you. I’ve just Googled Kierkegaard as my knowledge of Danish philosophers is somewhat patchy. I see he’s described as the ‘Father of Existentialism’, which amuses me given that poor Sir Harry’s been having a bit of an existential crisis this year. Phew! I checked this morning and you hadn’t updated – but I knew you wouldn’t disappoint! Humm – Ruth as a lady-in-waiting . . . and we know who she’s waiting for or rather who’s waiting for her. Let’s hope Kudos doesn’t disappoint – Can’t wait to see that ep. 6 trailer . . .
Read all the blogs, and green with envy here in the United states. PBS finished showing the rest of the Season 8 last month. For a fleeting moment, I thought that they would ‘indulge’ us in October with the new Season 9. No such luck. Season 8 came out in DVD in UK in September! I have been checking Amazon here every day, and no release date in sight for this side of the ocean. When will this torture end? You are so lucky there! Did anyone else spot the “deliberate” typo as Lighthouse came in to land at “Stanstead airport”. Doh! Yes – it stuck out like a sore thumb on my preview DVD. But I assumed it would be changed before transmission.